Ken Jennings is the dimmest flash in the pan in recent memory. As soon as he breaks that record, most of the people who have heard of him will easily forget him. The five day rule being lifted almost ruins the entire game but hopefully, Ken can be knocked off the proverbial mountain before making the big money and then soon be forgotten. 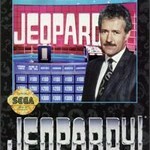 The game we have today is Jeopardy!. The original was soon followed by deluxe and sports versions in the same year. It came out during the streak of game show games being released for both Genesis and SNES. Apparently, someone at GameTek thought that game shows would be the next big cash cows of the gaming industry. I don’t think so. What you’ve got is the basic game, where up to three players can join in. Everything is, obviously, very close to the real thing or at least what the real thing was back in 1993. Choose the category, pick the money value, and recite the correct question to the answer. Do that in two consecutive rounds and play the Final Jeopardy round, where you answer one question for any amount of money. There really is no ending to winning, since it’s merely a party game anyway. The graphics look great for the Genesis, especially the Conan O’Brien (!) look-a-like. The laughably bad Alex Trebeck shot after a wrong answer is almost worth the price of admission alone. The backgrounds and other items from the show look almost picture perfect. It’s a great thing to look at. The only real music is the Jeopardy! theme but its been Genesis-ified. Both the little ‘whoosh’ and the “This….Is….Jeopardy!” from the intro sound almost perfect and should hit high on the nostalgia factor. The Alex sound bytes sound digitized, but are still decipherable. The buzzers are from the game but the audience is taken from Wheel of Fortune. The questions are distributed just like on the show; the first three lines are easy but suddenly become impossible after that. You may be able to get (guess?) the later ones. Just make sure you play with the a group with the same I.Q. as you or you might go bankrupt while the other two contestants go on to Final Jeopardy. Still, it all comes down to a game that does an excellent job of copying the show, although that may not be a good thing, given the difficulty of later questions. I believe the deluxe edition is even harder, and the sports version has questions so obscure that you may snap the cart in half with frustration (but do it alone, please. We don’t want to see you cry). The review is too generous by half — this home version of the game is the epitome of phoned-in mediocrity. The only thing that’s at least OK about the game is the database of questions, which are pretty good but skew too easy. The absence of difficulty settings, though, is inexcusable, and the presentation is poor. But the real game-breaker is the pacing, which is just far too slow; when the game pauses unnecessarily for an extra 1-2 seconds between every screen change, that adds up fast. 3/10.